Some files extensions have not been associated to a program on your computer. When this is the case, Windows doesn’t know how to open them. 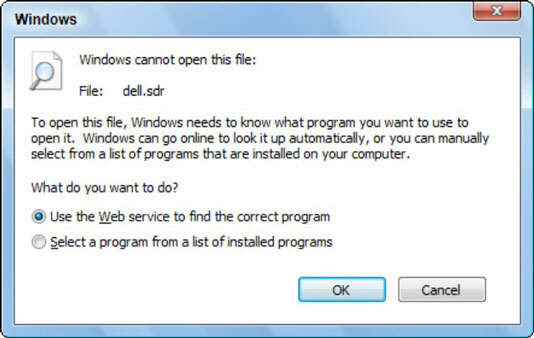 You will have to tell Windows what program to use to open the file. You can right click on the file icon and choose Open With (which will open the file one time) or you can create a file association (which will tell Windows what program to use for all files with that extension). The annoying dialog box shows up. Choose Select a Program from a List of Installed Programs. This tells Windows to show you programs that are installed on your computer. If you choose the Web service, it will look at the file extension to find any know programs associated with that extension. Pick a program from the list. To decide which program to use, you can call the person who sent you the file to find out what it was created in. Or, if you created it and just forgot to give it the right file extension, you can choose the program you created it in. But, it would be better to just change the file extension to one that is already associated with that program. Remove the check mark by Always Use the Selected Program to Open This Kind of File. You don’t want to make a permanent file association. If you’re lucky, you see its contents. If you’re unlucky, the file is gibberish, containing random bits of text or just unrecognizable junk. That’s okay; it was worth a try. It might be worth your while to choose the option for checking the web. The web service may find a program that you don’t have, but at least you will know why you can’t open the file. You can also visit the website www.filext.com. Type the extension and see what the database tells you. For example, if you received a file with the extension ODT, filext.com will reveal that the ODT extension belongs to Open Office documents. If you don’t have Open Office installed, you are unable to open the file. Nonetheless, knowing what type of document it is helps to either convert it or ask the person who sent the file to send it in another format, such as RTF or plain text.